Today is National Pet Day! National Pet Day was started in 2006 to celebrate the joy that pets bring to our lives, and remind us to consider pet adoption and helping pets – and pet owners – in need. While we all love – and pay attention to – our pets every day, observing National Pet Day can be a simple extension of that love! Simply take a little extra time today to give your pet that love and attention. If you don’t have a pet, drop by your local shelter to make a donation or see if they need any supplies, such as towels, blankets, pet toys, dog/cat food, or treats. Even the surprise of a gift card for a local coffee shop for the shelter staff, so dedicated to pet welfare, will show your love! Plan a Pet Day party! Invite your pooch’s friends over and celebrate! Schedule an extra long walk with your four-legged pal. Take your pet to her favorite place – the beach, the woods, her “grandparent’s” house! Buy a new toy or some special treats. 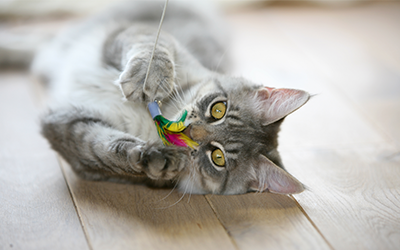 Play a game of “fetch” with your dog or “pounce” with your cat. Set up a maze for your hamster, gerbil, or rat. Give her a reward of fresh vegetables at the end. If you don’t have a pet, do something to support pets – and the people who love them. Make a donation to a foundation that helps pet owners who have fallen into financial hardship afford veterinary care for their pets. Visit a friend who is ill and can’t get out. Walking her dog for her is good for everyone! Visit an elderly neighbor with the gift of a treat or toy for their pet. Volunteer your time at a local shelter or rescue. Maybe you’ve been thinking of adopting a pet? Visit your local shelter to see if there is a pet that would be the perfect match for you! Don’t forget to share your celebrations using #NationalPetDay on social media! Take some time today to give a little extra love and attention to your pet. Doesn’t your pet deserve it? Note: This article, written by LifeLearn Animal Health (LifeLearn Inc.) is licensed to this practice for the personal use of our clients. Any copying, printing or further distribution is prohibited without the express written permission of Lifelearn. Please note that the news information presented here is NOT a substitute for a proper consultation and/or clinical examination of your pet by a veterinarian. Manage your pet's health online! Sign up for Pet Portal.